During the last few months, much of my limited free time was occupied by signing petitions, writing letters, using social media to spread the word, and emailing and calling my state senators, representatives, and governor in an effort to stop SB 2681 (the Mississippi Religious Freedom Restoration Act). If this is the first time you are reading about SB 2681, you should know that this bill adds "In God We Trust" to Mississippi's state seal and includes similar language as was found in Arizona's "turn away the gays" law. In essence, it appears to grant businesses the right to discriminate against LGBT persons and then hide behind their religious beliefs. After the bill passed the Senate at the end of January, significant grassroots opposition roared to life in February when we were told that the House was scheduled to vote on February 27. The vote was delayed, as the House sent the bill to committee for modification. I suspect that this would not have happened at all had the public opposition not been as substantial as it was. The bill was watered down to some degree, but much of the discriminatory language (and all the god stuff) remained. In mid-March, the bill passed the House in amended form. They split off the portion that appeared to permit religiously-based discrimination against LGBT individuals and sent it to a committee for further study. That is, the god stuff passed but the discriminatory part was set aside. This seemed like a partial victory to many opponents of the bill. 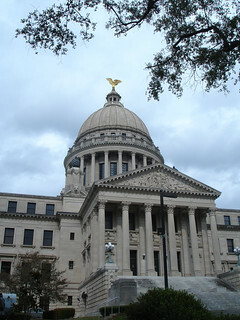 The most controversial part of the legislation (i.e., the part that appeared to allow discrimination) had been set aside; only the part violating church-state separation and communicating to Mississippi's atheists that we are not wanted in this state had passed. Disappointingly few people seemed to care about this portion of the bill. And then everything fell apart on April 1. In an instant, the discriminatory language was back and passed by the House. By April 3, the bill was on Gov. Phil Bryant's desk and ready for his signature. More petitions and a flurry of phone calls ensued, but it was no use. Gov. Bryant had asked for this bill, and he was determined to sign it over the opposition of all Mississippians who value equality and the separation of church and state. And sign it he did. The thoroughly unnecessary, alienating, and potentially discriminatory Mississippi Religious Freedom Restoration Act will become law on July 1. April 3 was a sad day for civil rights in Mississippi. At no point during this saga did I stop and ask myself why I was expending effort to stop SB 2681. I am not gay, and I could have used this as a reason not to get involved. This was the reason some of the people I tried to talk to about the importance of stopping the bill gave for their lack of involvement. While I am an atheist who values the separation of church and state, I could have decided that the addition of god language to our state seal has little direct impact on me and used that as a rationale not to care. Again, I heard this very argument from some people. So why did I get involved? Because it was the right thing to do. I value civil rights, equality, and the separation of church and state. I don't value these things only when I personally benefit from them; I value them as general guiding principles. I don't recall ever asking whether this was an issue in which I should involve myself. That I should be involved seemed self-evident. I am not quite sure how to put this into words, but I have noticed that as I grow older, the wisdom contained in the often quoted (and misquoted) idea that apathy and a refusal to act are all it takes for evil to prevail has become increasingly important to me. By remaining silent in the face of this sort of thing, I would become complicit in it. That is not acceptable to me.